Located in the Eastern District of Delhi, Max Super Specialty Hospital, Patparjan (Max PPG) serves a diverse patient population stretching from far flung rural communities to India’s densely populated capital city. Prior to 2011, patients arriving to Max PPG were received in a casualty department, where they were examined by a rotating staff of physicians, none of whom had training in Emergency Medicine (EM). In 2011 the Emergency Departments (ED) began hiring EM trained physicians, and in 2016 they partnered with George Washington University (GWU) to start an EM post-graduate residency training program. The need for emergency medicine in India is immense. Injury is the second most common cause of death after age 5, second only to ischemic heart disease . It is estimated that in 2016, 415 people died each day in India due to road traffic injuries, a staggering 32% increase in road traffic fatalities since 2007 . Despite the vast need, much of the healthcare sector in India has been slow to adapt, particularly regarding the need for quality education and training programs. The academic field of Emergency Medicine is new in India, having only been formally recognized in 2009 . As of 2018 officially sanctioned government training programs in India are able to train only 194 emergency physicians per year, presuming all available seats are filled. Using the United Kingdom and Singapore as comparisons, India would need to have approximately 132,000 practicing EM physicians to achieve similar proportions of emergency medicine physicians [4,5]. Recognizing the need for improved training in EM, in 2016 Max PPG partnered with GWU to offer the Masters in Emergency Medicine (MEM), a 3-year training program in EM and acute care. In the two short years since starting a formal training program the quality of care provided in the ED at Max PPG has improved dramatically. Since starting the MEM program, the annual ED census at Max PPG has nearly doubled, from 18,300 patients per year before opening the program, to over 30,000 in 2018. The department is staffed 24 hours a day, 7 days a week by a rotating group of 7 consultants and 11 EM residents. Max PPG is a STEMI, stroke, and trauma center that sees an average of 500 heart attacks and 600 strokes per year. Since opening the ED they have vastly improved their rapid assessment and treatment of heart attack and stroke. Their average time to shift a patient suffering a heart attack to the cath lab is now 27 minutes, with a record best of 4 minutes. Likewise their average door-to-needle time for thrombolysis of stroke is 31 minutes, with a record best of 9 minutes. Consultants at Max PPG have been recognized for their outstanding work in Emergency Medicine education and training. Dr. Meghna Halder, an Associate Consultant, was recognized by the Max Healthcare system with the “Rising Star” award in 2017 and the “Going the Extra Mile” award in 2018 for her dedication to excellence in education. 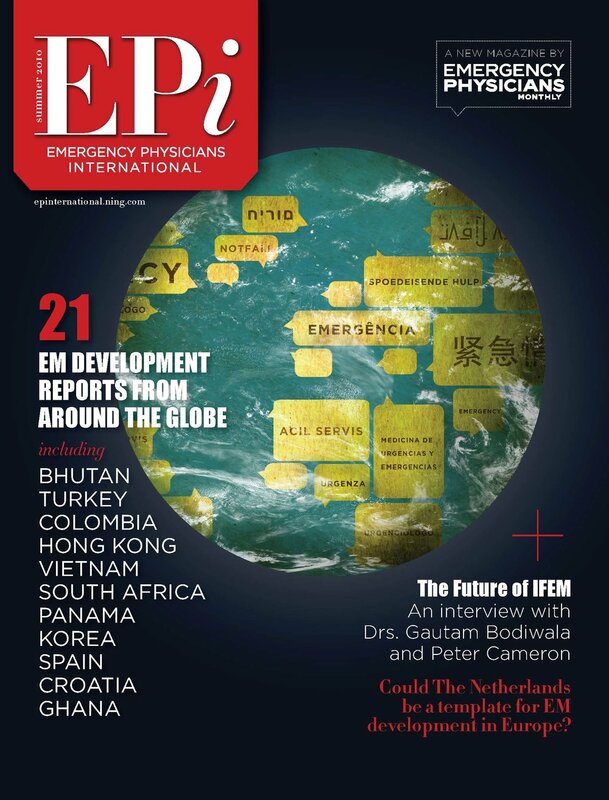 Many Max PPG faculty serve in leadership positions of local and international Emergency Medicine societies including the Society of Emergency Medicine in India (SEMI), the Asian Society for Emergency Medicine (ASEM) and the American College of Emergency Physicians (ACEP). They have lectured at national and international conferences on topics ranging from trauma scoring systems to disaster relief. In 2013 department Vice-Chair Dr. Ankur Verma was invited to Harvard to present his work in disaster medicine at the World Extreme Medicine Exposition6. The Max PPG ED has also been recognized for “overall excellence” within the Max hospital system. In 2018 it was ranked the 8th best ED in India by the Times of India health survey . The key to the department’s success has been a consistent dedication to emergency training, and nurturing a supportive learning environment. All consultants at Max PPG are certified trainers in BLS, ACLS, PALS, ATLS, PTC and FCCS. Faculty are trained in bedside ultrasound and have integrated their knowledge into the residency curriculum. Max PPG faculty have been recognized nationally and internationally for their excellence in education. In 2015 junior faculty member Dr. Wasil Sheikh was recognized for advocacy in emergency medicine by the global academy of emergency medicine at LIJ North Shore Hospital. That same year he was also given the SEMI Rising Star Award. As part of their teaching agreement with GWU, local faculty teaching is augmented by visiting international faculty who come every month for dedicated lectures and bedside teaching in core EM curriculum. The ED team at Max PPG have worked hard over the past 8 years to establish treatment protocols and initiate research to identify best practices. They have published literature in international emergency medicine journals on a range of topics including trauma mortality prediction scores, toxicology, and dengue encephalitis among others. The Max PPG ED remains dedicated to their mission to expand access to emergency care in India through evidence based medicine and providing high quality training for the next generation of emergency physicians. 1) India: WHO statistical profile. Accessed at http://www.who.int/gho/countries/ind.pdf ?ua=1 on 10/11/2018. 2) Road Crash Statistics 2016. Analysis of Transport Research Wing, Ministry of Road Transport and Highways data 2016. Accessed at http://savelifefoundation.org/wp.content/uploads/2017/10/Traffic-Research-Wing-Data2016_Analysis_SLE.pdf on 10/11/2018. 3) Jain M, B Batra, E Clark, T Kole. Development of Post-graduate program in emergency medicine in India: Current status, scope, and career pathways. Medical Education: New Frontiers. 2014;1(3),218-221. 4) NHS Key Statistics England May 2018 House of Commons Library Briefing Paper Number 7281, 21 May 2018 Accessed at https://researchbriefings.parliment.uk/ResearchBriefing/Summary/CBP-7281 on 10/11/2018. 5) Department of Health Australia’s Future Health Workforce - Emergency Medicine. Accessed at http://www.health.gov.au/internet/main/publishing.nsf/Content/australias-future-workforce-reports on 10/11/2018. 7) “Times Health Survey: Emergency and Trauma National Rankings.” The Times of India, 28 Feb. 2018.